Another Wednesday, which means another contribution for Mo Manning’s Dream Team from me. This time I’ve used Ragged Winnie on this very simple Christmas card. I colored my image with Copics and sprinkled Chunky White embossing powder on top. I added some scraps of patterned paper from Pion Design, stamped a Norsk Stempelblad AS sentiment and used a bit of foam behind my main panel for dimension. 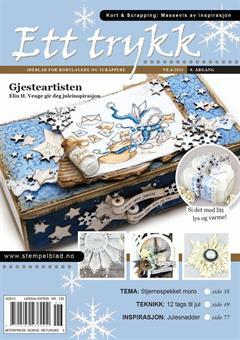 I embellished very simply with a diecut snowflake with covered in Distress glitter. And that’s it. No, it’s not. It’s an A2 size CARD. You’re confusing card sizes with paper sizes, which is a fairly common mistake. An A2 size card is 4 1/4 by 5 1/2″ (10.795 cm x 13.970 cm), whereas an A2 size sheet of paper is 420 by 549 mm (42.0 x54.9 cm). Paper sizes decrease as the A numbers increase, card sizes increase as the A numbers get higher. An A7 size card is 5 1/8 by 7″ (13.02 x 17.78 cm), but an A7 size sheet of paper is 74 by 105 mm (7.4 x 10.5 cm). thank you, I don’t realy heart from “card- size” *lol*, I do but I don’t internalize it *hahaha*. I know that A6 is here a card with 10,5×14,8cm, but at this time I saw that was writen “DOUBLE” card *lol*. Oooooh I so *l*o*v*e* this card! Your colouring is absolutely stunning! You are so right not to use lots of embellishments because now all the attension is drawn to the stamp.